"We are all for our Nation, for our Emblem and Glory!" Lebanon ( Arabic: لبنان ), officially the Lebanese Republic ( Arabic: الجمهورية اللبنانية ), is a small, largely mountainous country in the Middle East, located at the eastern edge of the Mediterranean Sea. Lebanon is bordered by Syria to the north and east, and Israel to the south. The flag of Lebanon features the Lebanon Cedar in green against a white backdrop, with two horizontal red stripes on the top and bottom. Until the Lebanese Civil War ( 1975- 1990), the country enjoyed remarkable prosperity. It was considered the banking capital of the Arab world and was widely known as the "Switzerland of the Middle East" due to its financial power. Lebanon also attracted large numbers of tourists, to the point that the capital Beirut became widely referred to as the "Paris of the Middle East." Immediately following the end of the war, there were widespread efforts to revive the economy and rebuild national infrastructure, with the first positive results becoming evident in recent years. By early 2006, a considerable degree of stability had been achieved throughout much of the country, Beirut's reconstruction was almost complete, and an increasing number of foreign tourists were pouring into Lebanon's resorts. However, the commencement of the 2006 Israel-Lebanon conflict on July 12, 2006 brought mounting civilian and military casualties, great damage to civilian infrastructure, and massive population displacement. 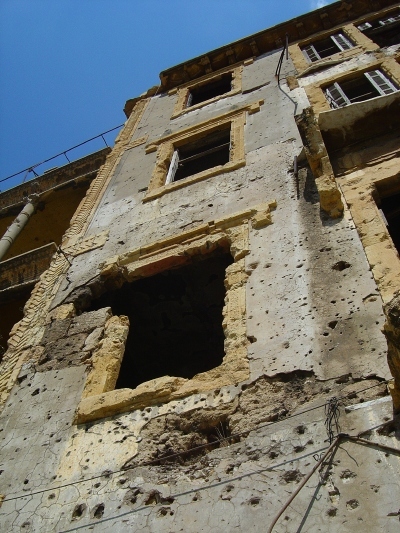 As of September 2006, the Lebanese government has been acting out an early recovery plan aimed at reconstructing property destroyed by Israeli attacks in Beirut, Tyre, and other villages in southern Lebanon. The name Lebanon ("Lubnan" in standard Arabic; "Lebnan" or "Lebnèn" in local dialect) is derived from the Semitic root "LBN", which is linked to several closely-related meanings in various languages, such as white and milk. This is regarded as reference to the snow-capped Mount Lebanon. Occurrences of the name have been found in three of the twelve tablets of the Epic of Gilgamesh (2900 BC), the texts of the library of Elba (2400 BC), and the Bible. In British English, the country is sometimes referred to with the definite article as "the Lebanon", like the Sudan, the Ukraine, or The Gambia. Prepending a "the" to the name possibly results from the fact that when these names came into usage, they were merely geographical regions, rather than independent states. A Middle Eastern country, Lebanon is bordered by the Mediterranean to the west with a 225 km coastline, by Syria to the east and north, and by Israel to the south. The Lebanon-Syria border stretches for 375 km, while the Lebanon-Israel border is 79 km in length. The border with the Israel-occupied Golan Heights in Syria is disputed by Lebanon in a small area called Shebaa Farms, but the border has been demarcated by the United Nations (see Blue Line). Lebanon has a total area of 10,452 km² (4,035 mi²), making it the 178th largest country in the world. Most of that area is mountainous terrain, except for the narrow coastline and the Beqaa Valley (an integral part of Lebanon's agriculture). Lebanon has a moderate Mediterranean climate. In coastal areas, winters are generally cool and rainy whilst summers are hot and humid. In more elevated areas, temperatures usually drop below 0°C during the winter with frequent (sometimes heavy) snow; summers, on the other hand, are warm and dry. Although most of Lebanon receives a relatively large amount of rainfall annually (compared to its arid surroundings), certain areas in north-eastern Lebanon receive little rainfall. This is due to the region's proximity to dry areas in Syria and to the fact that the high peaks of the western mountain front block much of the rain clouds that originate over the Mediterranean Sea. The population of Lebanon is composed of three predominant ethnic groups and religions: Muslims ( Shi'ites, Sunnis, and Alawites), Druze, and Christians (mostly Maronites, Greek Orthodox, Armenian Apostolic, Melkite Greek Catholics). No official census has been taken since 1932, reflecting the political sensitivity in Lebanon over confessional (religious) balance. It is estimated that about 40% are Christians, 35% are Shia Muslims, 20% are Sunni Muslims and 5% are Druze . A minority of Jews live in central Beirut, Byblos, and Bhamdoun. Also, a small community (less than 1%) of Kurds (also known as Mhallamis or Mardins) live in Lebanon. The number of those inhabiting Lebanon proper was estimated at 3,874,050 in July 2006. There are approximately 16 million people of Lebanese descent, spread all over the world, Brazil being the country with the biggest Lebanese community abroad. Argentina, Australia, Canada, Colombia, France, Great Britain, Mexico, Venezuela and the US also have large Lebanese communities. 394,532 Palestinian refugees have registered in Lebanon with the United Nations Relief and Works Agency (UNRWA) since 1948. Estimates of those remaining range between 180,000 and 250,000. The Palestinians have indeed become a vital part of the Lebanese society, with many of them reaching high posts, despite the notorious governmental bans on them. It is not only impossible for them to own property, but until 2005 there were an estimated 46 jobs that they were not allowed to practice in Lebanon. In recent years the idea of granting Palestinians Lebanese citizenship has been discussed; however this notion has been rejected by most of the Lebanese and Palestinian communities. The urban population, concentrated mainly in Beirut and Mount Lebanon, is noted for its commercial enterprise. A century and a half of migration and return have produced Lebanese commercial networks around the globe from North and South America to Europe, the Persian Gulf, and Africa. Lebanon has a high proportion of skilled labour comparable to most European nations and the highest among Arab countries. One notable aspect of Lebanon's social system and laws is that when a child is born to one Lebanese parent, that Lebanese child receives Lebanese citizenship only if the father is Lebanese. Citizenship rights are denied to a child born to a Lebanese mother . Such gender discrimination in a country where mothers are predominantly the main care providers for children has disenfranchised children of Lebanese descent for many generations. Although ideally suited for agricultural activities (in terms of water availability and soil fertility), Lebanon does not have a large agricultural sector. Attracting a mere 12% of the total workforce, agriculture is the least popular economic sector in Lebanon. It contributes approximately 11.7% of the country's GDP, also placing it in the lowest rank compared to other economic sectors. Lebanon's lack of industry raw material and complete dependency on Arab countries for oil has made it difficult for the Lebanese to engage in significant industrial activity. As such, industry in Lebanon is mostly limited to small businesses concerned with reassembling and packaging imported parts. In 2004, industry ranked second in workforce, with 26% of the Lebanese working population, and also second in GDP contribution, with 21% of Lebanon's GDP. A combination of beautiful climate and many historic landmarks and World Heritage Sites has continually attracted large numbers of tourists to Lebanon annually, in spite of its political instability. In addition, Lebanon's strict financial secrecy and capitalist economy—unique in its area—have given it significant economic status among Arab countries. The thriving tourism and banking activities have naturally made the services sector the most important pillar of the Lebanese economy. The majority of the Lebanese workforce (nearly 65%) have preferred employment in the services sector, as a result of the abundant job opportunities and large paychecks. The GDP contribution, accordingly, is very large and amounts to roughly 67.3% of the annual Lebanese GDP. The economy's dependence on services has always been an issue of great criticism and concern, since this renders the country subject to the instability of this sector and the vagaries of international trade. The 1975-1990 civil war seriously damaged Lebanon's economic infrastructure, cut national output by half, and all but ended Lebanon's position as a Middle Eastern entrepôt and banking hub. The subsequent period of relative peace enabled the central government to restore control in Beirut, begin collecting taxes, and regain access to key port and government facilities. Economic recovery has been helped by a financially sound banking system and resilient small- and medium-scale manufacturers, with family remittances, banking services, manufactured and farm exports, and international aid as the main sources of foreign exchange. Until the 2006 Israel-Lebanon conflict, Lebanon's economy witnessed excellent growth, with bank assets reaching over 75 billion dollars. Even though Lebanon was down 10% in the tourism sector in 2005, more than 1.2 million tourists visited Lebanon that year. Market capitalization was also at an all time high, amounting to over $7 billion at the end of January 2006. The war severely damaged Lebanon's fragile economy, especially the tourism sector. According to a preliminary report published by the Lebanese Ministry of Finance on August 30, 2006, a major economic decline was expected as a result of the fighting. Beirut International airport re-opened in September 2006 and the efforts to revive the Lebanese economy have since been proceeding at a slow pace. Major contributors to the reconstruction of Lebanon include Saudi Arabia (with 1.5 billion US dollars pledged), the European Union (with about $1 billion) and a few other Gulf countries with contributions of up to $800 million. The first two ministries to be established for education in Lebanon were the Ministry of Education and Higher Education, and the Ministry of Vocational and Technical Training, to enrich the Lebanese educational system. In 1946, after independence ( 22 November 1943) the Lebanese government replaced the old curriculum program, coming from the French mandate, by new ones and the Arabic language was imposed upon all schools as a primary language, mandatory in the different phases of education. The government also left students the freedom to choose a second or third language (French, English, etc). In 1968 and 1971, the curriculum was changed again. Each step of the educational phases was specified with a defined goal and the contents of the public examinations were also particularized. Before the war, in 1975, Lebanon held one of the highest literacy rates in the Arab world. Over 80% of the Lebanese people could read and write. But ever since then, Lebanon has been in a state of chaos that has consumed its people, due to the civil war and foreign intervention that took place. When the war was declared ‘over’, the Lebanese took a start on rebuilding their cultural society in the educational domain and encouraging education through free and facilitated methods. Lebanon now sports a literacy rate of 88.3%, still among the highest in the Arab World. Lebanese schools are divided into three categories: private, public, and mid-private. Public schools are under government authority (Ministry of Education) and free, supported by tax money. The Ministry of Education provides all the public schools with the books needed for each educational level, for negligible prices and often for free. Mid-private schools, mainly parochial schools, such as the Ecoles des Saint Coeurs, are those that operate as private schools yet charge fees close to those of public schools. The rest of the tuition fee is subsidized by the government. All Lebanese schools are required by the government to follow a prescribed curriculum designed by the Ministry of Education. Private schools may also add more courses to their curriculum with approval from the Ministry of Education. Computer lessons, for example, are now very common in many schools although they are not a part of the traditional mandatory curriculum. For the schools without computer facilities, any student interested may take up computer courses at private institutions or centers available in almost all the Lebanese districts. Public schools altogether amount to a total of 192 high schools and 1,125 elementary schools. Of the high schools, 16 are strictly for boys, 12 are girl schools, and 164 are mixed. In the elementary school, a total of 238,556 students are enrolled and taught by 24,463 teachers. In all the schools, pupils receive their instructions from the teachers of each subject taught and not one classroom teacher. The number of students per classroom ranges between 15 in selective private schools and 40 in some public schools due to the lack of teachers and facilities. The main subjects taught are Mathematics, Sciences, History, Civics, Geography, Arabic, and French/English/both. Other rotating teachers within the school teach Physical education, Art, and library use (not available in all). The subjects gradually increase in difficulty and in number. Students in Grade 11, for example, usually study eighteen different subjects. The government introduces a mild form of selectivity into the curriculum by giving 11th graders choice between two "concentrations": Sciences or Humanities, and 12th graders choice between four concentrations: Life Sciences (SV), General Sciences (SG), Sociology and Economics (SE), and Humanities and Literature (LH). The choices in concentration do not include major changes in the number of subjects taken (if at all). However, subjects that fall out of the concentration are given less weight in grading and are less rigorous, while subjects that fall within the concentration are more challenging and contribute significantly to the final grade. Intermediate: three years; students earn Intermediate Certification (Lebanese Brevet) at completion. Secondary: three years, students who pass official exams earn a Baccalaureate Certificate (Baccalauréat Libanais) in one of the four concentrations they took in 12th grade. These three phases are provided free to all students and are, by law, compulsory. Nevertheless, the compulsory part is currently not fully enforced. There are plans to change this in the near future. Following high school, Lebanese students may choose to study at a university, a college, an institute, or a "high technical school". The number of years to complete each program varies. Lebanon has twenty-one universities, several of which are internationally recognized. The American University of Beirut (AUB) was the first English university to open in Lebanon, while the first French university to open was the Université Saint-Joseph (USJ). The twenty-one universities, both public and private, largely operate in Arabic, French, or English as these are the most widely used languages in Lebanon. There are four French institutions, seven English, and one Armenian. At the English universities, students who have graduated from an American-style high school program enter at the freshman level to earn their baccalaureate equivalence from the Lebanese Ministry of Higher Education. This qualifies them to continue studying at the higher levels. Such students are required to have already taken the SAT I and the SAT II upon applying to college, in lieu of the official exams. On the other hand, students who have graduated from a school that follows the Lebanese educational system are directly admitted to the sophomore year. These students are still required to take the SAT I, but not the SAT II. Lebanon has been a major crossroads of civilizations for millennia, so it is not surprising that this small country possesses an extraordinarily rich and vibrant culture. Lebanon's wide array of ethnic and religious groups contributes to the country's rich cuisine, musical and literary traditions, and festivals. Beirut in particular has a very vibrant arts scene, with numerous performances, exhibits, fashion shows, and concerts held throughout the year in its galleries, museums, theatres, and public spaces. Lebanese society is modern, educated, and perhaps comparable to European societies of the Mediterranean. Most Lebanese are bilingual, speaking Arabic and French, this is why Lebanon is a member state of the Organisation Internationale de la Francophonie; however, English has become popular, especially among university students. The country is not only where Christianity intermingles with Islam, but Lebanon is also an Arab gateway to Europe and a European bridge to the Arab world. Lebanon also hosts several prestigious universities, including the Lebanese University, the American University of Beirut, the Université Saint-Joseph, the American University College of Science and Technology and the Lebanese American University. Several international festivals are held in Lebanon, featuring world-renowned artists and drawing crowds from Lebanon and abroad. Among the most famous are the summer festivals at Baalbek, Beiteddine, and Byblos. Lebanese people in Lebanon and all over the world have made substantial contributions to Lebanon and Humanity. A List of Lebanese people will sum up the contributions of the Lebanese and persons of Lebanese descent worldwide. the Prime Minister must be a Sunni Muslim. This arrangement is part of the " National Pact" ( Arabic: الميثاق الوطني , al Mithaq al Watani), an unwritten agreement which was established in 1943 during meetings between Lebanon's first president (a Maronite) and its first prime minister (a Sunni), although it was not formalized in the Lebanese Constitution until 1990, following the Taif Agreement. The pact included a promise by the Christians not to seek French protection and to accept Lebanon's "Arab face", and a Muslim promise to recognize independence and legitimacy of the Lebanese state in its 1920 boundaries and to renounce aspirations for union with Syria. This pact was thought at the time to be an interim compromise, necessary until Lebanon formed its own sense of a national identity. The pact might have been a temporary solution as Muslims still continued to feel a strong sense of need to unite with their Arab counterparts. The Christians, on the other hand, rejected this and, in an attempt to gain support, they later suggested federalism, and formed an alliance with Israel. Lebanon's continued existence and the fallout from subsequent civil wars continue to dominate politics in Lebanon. The pact also stipulated that seats in the Parliament would be allocated by religion and region, in a ratio of six Christians to five Muslims, a ratio based on the 1932 census, which was taken at a time when Christians still had a slight majority. The Taif Agreement adjusted the ratio to grant equal representation to followers of the two religions. Today, Muslims are a majority, especially when taking the Palestinian presence to be a factor, but most sides in Lebanon are still satisfied with the equality. The Constitution grants the people the right to change their government. However, from the mid-1970s until the parliamentary elections in 1992, civil war precluded the exercise of political rights. According to the constitution, direct elections must be held for the parliament every four years. The last parliament election came after the assassination of PM Rafiq Hariri, and saw a stern shift in Lebanese powers as Syrian opposers won the majority of the seats. The parliament composition is based more on ethnic and religious identities as opposed to ideological features. The Taif Accord ending the civil war modified the distribution of parliament seats. The Parliament elects the President of the republic to a six-year term. Consecutive terms for the president are forbidden. This constitutional rule has been bypassed by ad-hoc amendment twice in recent history, however, at the urging of the Syrian government. Elias Hrawi's term, which was due to end in 1995, was extended for three years. This procedure was repeated in 2004 to allow Emile Lahoud to remain in office until 2007. Pro-democracy campaigners denounced the moves. The last presidential election was in 1998. The President appoints the Prime Minister on the nomination of the Parliament. Lebanon has numerous political parties, but their role is less important than in most parliamentary systems. Most represent, in practice if not in theory, sectarian interests; many are little more than ad-hoc lists of candidates endorsed by a well-known national or local figure. Electoral tickets are often formed on a constituency-by-constituency basis by negotiation among local leaders of clans, religious groups, and political parties; these loose coalitions generally exist only for the election and rarely form cohesive blocs in the Parliament subsequently. Currently, Lebanon's Parliament is split into roughly three alliances: the generally anti-Syrian March 14 Alliance, the pro-Syrian alliance consisting primarily of Hezbollah and Amal and the bloc of Maronite former General Michel Aoun, recently allied with Hezbollah. Lebanon's judicial system is based on the Napoleonic Code. Juries are not used in trials. The Lebanese court system consists of three levels: courts of first instance, courts of appeal, and the court of cassation. There also is a system of religious courts having jurisdiction over personal status matters within their own communities, with rules on matters such as marriage, divorce, and inheritance. Lebanese law does not provide for Civil marriage (although it recognizes such marriages contracted abroad); efforts by former President Elias Hrawi to legalize civil marriage in the late 1990s floundered on objections mostly from Muslim clerics. Additionally, Lebanon has a system of military courts that also has jurisdiction over civilians for crimes of espionage, treason, and other crimes that are considered to be security-related. These military courts have been criticized by human rights organizations such as Amnesty International for "seriously fall[ing] short of international standards for fair trial" and having "very wide jurisdiction over civilians". 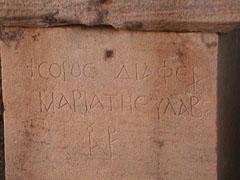 Inscription in Greek on one of the tombs found in the Roman-Byzantine necropolis in Tyre. Lebanon was the homeland of the Phoenicians, a seafaring people that spread across the Mediterranean before the rise of Alexander the Great. Carthage, which threatened Rome, was a Phoenician colony. Alexander burned Tyre, the leading Phoenician city, ending the Phoenician independence. The country became part of numerous succeeding empires, among them Persian, Roman, Byzantine, Arab, Crusader, and Ottoman. Lebanon was part of the Ottoman Empire for over 400 years, but following World War I, the area became a part of the French Mandate of Syria. On September 1, 1920, France formed the State of Greater Lebanon as one of several ethnic enclaves within Syria. Lebanon was a largely Christian (mainly Maronite) enclave but also included areas containing many Muslims and Druzes. On September 1, 1926, France formed the Lebanese Republic. The Republic was afterward a separate entity from Syria but still administered under the French Mandate for Syria. Lebanon and Syria both gained independence in 1943, while France was occupied by Germany. General Henri Dentz, the Vichy High Commissioner for Syria and Lebanon, played a major role in the independence of both nations. The Vichy authorities in 1941 allowed Germany to move aircraft and supplies through Syria to Iraq where they were used against British forces. The United Kingdom, fearing that Nazi Germany would gain full control of Lebanon and Syria by pressure on the weak Vichy government, sent its army into Syria and Lebanon. The flag of Greater Lebanon (1920-1943). After the fighting ended in Lebanon, General Charles de Gaulle visited the area. Under various political pressures from both inside and outside Lebanon, de Gaulle decided to recognize the independence of Lebanon. On November 26, 1941, General Georges Catroux announced that Lebanon would become independent under the authority of the Free French government. Elections were held in 1943 and on November 8, 1943 the new Lebanese government unilaterally abolished the mandate. The French reacted by throwing the new government into prison. In the face of international pressure, the French released the government officials on November 22, 1943 and accepted the independence of Lebanon. The allies kept the region under control until the end of World War II. The last French troops withdrew in 1946. Lebanon's unwritten National Pact of 1943 required that its president be Christian and its prime minister be Muslim. Lebanon's history since independence has been marked by alternating periods of political stability and turmoil (including a civil conflict in 1958) interspersed with prosperity built on Beirut's position as a regional centre for finance and trade. Five years after gaining independence, Lebanon entered into the 1948 Arab-Israeli War. It took over logistical support of the Arab Liberation Army after it found itself cut off from its bases in Syria while attempting an attack on the newly-proclaimed Jewish State. After the defeat of the Arab Liberation Army in the Battle of Sasa, Lebanon accepted an armistice with Israel on March 23, 1949. Approximately 100,000 Palestinian refugees were living in Lebanon in 1949 as a direct result of the creation of Israel and the subsequent war. The Lebanese-Israeli border remained closed, but quiet, until after the Six Day War in 1967. Building damaged during the 1975-1990 civil war. In 1975, civil war broke out in Lebanon. The Lebanese Civil War lasted fifteen years, devastating the country's economy, and resulting in the massive loss of human life and property. It is estimated that over 100,000 people were killed and another 100,000 maimed. The war ended in 1990 with the signing of the Taif Agreement and Lebanon left in ruins. During the civil war, Lebanon was twice invaded and occupied by the Israel Defense Forces (IDF) in 1978 and 1982. Israel remained in control of Southern Lebanon until 2000, when there was a general decision, led by Israeli Prime Minister Ehud Barak, to withdraw due to continuous guerrilla attacks executed by Hezbollah militants and a belief that Hezbollah activity would diminish and dissolve without the Israeli presence. The UN determined that the withdrawal of Israeli troops beyond the blue line was in accordance with UN Security Council Resolution 425, but Lebanon claimed that Israel still occupied a disputed region called the " Shebaa Farms". Hezbollah declared that it would not stop its operations against Israel until this area and what they described as "all of occupied Palestine" were liberated. After the end of the civil war, Lebanon saw a period of relative calm until the 2006 Israel-Lebanon conflict. The international media coined the term "Cedar Revolution", but the Lebanese media also uses the term " Intifada (uprising) of Independence." The event that triggered this outcry took place on February 14, 2005, when Lebanon was shaken by the assassination of former Prime Minister Rafik Hariri in a car bomb explosion. Certain political figures, who later became the leaders of the Forces of March 14, accused Syria for the attack, due to its extensive military and intelligence presence in Lebanon, and to the public rift between Hariri and Damascus over the Syrian-backed constitutional amendment extending pro-Syrian President Lahoud's term in office. Syria denies any involvement. Others, namely the Forces of March 8, considered that the assassination may have been executed by the American CIA or the Israeli Mossad in an attempt to destabilize the country. Sadly the Hariri assassination only marked the beginning of a series of assassination attempts that led to the loss of many prominent Lebanese figures. On June 2, 2005, the journalist and historian Samir Kassir, also a founding member of the Democratic Left Movement was assassinated by a car bomb. Less than one month later, on June 21, 2005, George Hawi, the former Secretary General of the Lebanese Communist Party was also assassinated by a car bomb in Beirut. On September 25, 2005, there was a failed assassination attempt on a Lebanese Broadcasting Corporation news anchor, in which May Chidiac lost her left leg below the knee and received severe injuries to her left arm, later resulting in the amputation of her left hand. Since then, May Chidiac won the UNESCO/Guillermo Cano World Press Freedom Prize 2006. Editor-in-chief and CEO of the An-Nahar newspaper, journalist Gebran Tueni, was assassinated by a car bomb in the suburbs of Beirut on December 12, 2005. On November 21, 2006, 34 year old industrial minister Pierre Gemayel was assasinated in Beirut by three men who intercepted his car and shot him to death. Distrustful of the impartiality of local Lebanese officials the UN initiated its own investigation into the assassination of al-Hariri, the findings of which were officially published on 20 October, 2005 in the Mehlis report. This report suggested the assassination was carried out by a group with considerable resources, that it had been prepared many months in advance, and that the group had detailed knowledge of Rafik Hariri’s movements. International forensic teams identified the vehicle used for the explosion as a Mitsubishi Canter stolen on 12 October, 2004 in Sagamihara City, Japan, and that the explosion was most likely detonated by a suicide bomber. On the testimony of a witness of Syrian origin but a resident in Lebanon, who claims to have worked for the Syrian intelligence services in Lebanon the Mehlis report states that this vehicle was prepared at a military base in Syria and was driven across the border into Lebanon by a Syrian colonel from the Tenth Army Division. This investigation into the Hariri assassination is ongoing and has yet to be concluded. On 17 January, 2006 the UN appointed Serge Brammertz to continue the investigation; the report from this investigation has yet to be published. On February 28, 2005, with over 70,000 people demonstrating in Martyrs' Square, Prime Minister Omar Karami and his Cabinet resigned. In response, Hezbollah organized a large counter-demonstration of nearly 1 million people, staged on March 8 in Beirut, supporting Syria and accusing Israel and the United States of meddling in internal Lebanese affairs. On March 14, 2005, one month after Hariri's assassination, throngs of people rallied in Martyrs' Square in Lebanon with around 1 million people,. Protestors marched demanding the truth about Hariri's murder and independence from Syrian presence in Lebanon. The march reiterated their desire for a sovereign, democratic, and unified country, free of Syria's hegemony. In the weeks following the demonstrations, bombs were detonated in Christian areas near Beirut. Although the damage was mostly material, these acts demonstrate the danger of Lebanon relapsing into sectarian strife. Eventually, and under pressure from the international community, Syria withdrew its 15,000-strong army troops from Lebanon. The last uniformed Syrian soldier left Lebanon on April 26, 2005. On April 27, 2005, the Lebanese celebrated their first free-from-Syria day. UN forces led by Senegalese Brig. Gen. Mouhamadou Kandji were sent to Lebanon to verify the military withdrawal which was mandated by UN Security Council Resolution 1559. During the first parliamentary elections held after Syria's withdrawal from Lebanon in May 2005, the anti-Syrian coalition of Sunni Muslim, Druze and Christian parties led by Saad Hariri, son of assassinated ex-Prime Minister Rafik Hariri, won a majority of seats in the new Parliament. The Free Patriotic Movement (FPM) however, did not ally with the Rafik Hariri Martyr List during these elections because they were seen by some as still attached to their sectarian identities. Thus the FPM won a minority of seats in the parliament. The political alliances were interesting in that in some areas the anti-Syrian coalition allied with Hezbollah and in others with Amal. They did not win the two-thirds majority required to force the resignation of Syrian-appointed President Lahoud voted for by Rafik Hariri parliamentary bloc, due to the unexpectedly strong showing of formerly exiled General Michel Aoun's Free Patriotic Movement party in Mount Lebanon. Despite being staunchly anti-Syrian during his 15-year exile, upon his return Aoun aligned himself with politicians who were friendly to the Syrians in the past decade: Soleiman Franjieh Jr and Michel Murr. Their alliance dominated the north and the Metn District of Mount Lebanon. Saad Hariri and Walid Jumblatt joined forces with the two staunchly pro-Syrian Shiite movements, Hezbollah and Amal, to secure major wins in the South, Beqaa, as well as the Baabda and Aley districts of Mount Lebanon. This alliance proved temporary. On February 6, 2006, Hezbollah signed an understanding of disarmament with Michel Aoun, the leader of the Free Patriotic Movement. After the elections, Hariri's Future Movement party, now the country's dominant political force, nominated Fouad Siniora, a former Finance Minister, to be Prime Minister. His newly formed representative government has obtained the vote of confidence from the parliament. On July 18, 2005, Lebanon elected a new parliament dominated by an anti-Syrian coalition. This parliament approved a motion to free Samir Geagea, who had spent most of the past eleven years in solitary confinement in an underground cell with no access to news. 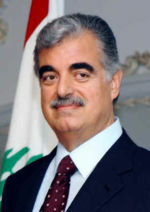 The motion was endorsed by pro-Syrian Lebanese President Émile Lahoud the next day. The following months proved the government's inability to begin the economic and political reforms promised to the people. 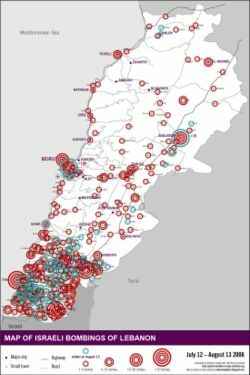 Areas in Lebanon targeted by Israeli bombing, 12 July to 13 August 2006. On July 12, 2006 Hezbollah captured two Israeli soldiers in a cross-border operation, killing three others, and simultaneously launched a missile attack along the border. The operation was considered "an act of war" by Israeli Prime Minister Ehud Olmert. That night, after a failed rescue attempt that resulted in the deaths of five more Israeli soldiers, Israel launched a massive military operation on Lebanon, with the stated goal of eliminating Hezbollah and retrieving the captured soldiers. The operation quickly developed into "open war" as Israel continued to bomb large areas in Lebanon and Hezbollah launched thousands of rockets into Northern Israel. One of the first targets of the Israeli bombings was the Rafic Hariri International Airport in southern Beirut. Diplomatic action eventually resulted in the release of UN Security Council Resolution 1701 which called for an immediate cessation of hostilities, and an international embargo on supplying arms to Hezbollah. Three days later, on August 14, 2006, the partial cease-fire came into effect. However, Israel continued to impose a naval and aerial blockade on Lebanon, in an attempt to prevent arms from reaching Hezbollah. By September 8, 2006, both blockades had been lifted. During and after that period, several breaches of the cease-fire have been recorded. The level of destruction that hit Lebanon has been described by the country's Prime Minister Fouad Siniora as "unimaginable." Much of Lebanon's infrastructure was destroyed, mainly bridges and roads, and estimates of the overall damage approached $15 billion. As a result of the conflict, 1,191 Lebanese civilians were killed and 4,409 injured. In addition, approximately 1,000,000 Lebanese were displaced and forced to flee to safer areas. On the Israeli side, 44 civilians were killed and approximately 1,350 injured. Estimates of the number of Hezbollah fighters killed range from 80 to 700, while 119 IDF soldiers were confirmed killed and approximately 400 injured. Many countries have provided much-needed aid to Lebanon. Major contributors include Saudi Arabia, Jordan, the European Union, the United Arab Emirates, and Egypt among others. During the war, the Jordanians helped by loading planes with about 67,500 blankets and mattresses as well as boxes of drugs and food. Sea routes were used to bring in supplies in large quantities to help some of the displaced people living in schools and with host families in Lebanon. In response to the growing international pressure for disarming Hezbollah, Hassan Nasrallah, the leader of Hezbollah, held a "victory celebration" in southern Beirut on September 22, 2006, which was attended by hundreds of thousands in a show of support to the continuing resistance. During the proceedings, Nasrallah proclaimed that no one would ever disarm Hezbollah and vowed to take action in retaliation for what he described as Israeli hostilities. He also added that, should Lebanon become capable of self-defense, Hezbollah would willingly lay down its arms. Lebanon's current situation is highly fragile, as opposition to the standing government recently spiked in an uprising reminiscent of the Cedar Revolution and the events that precipitated the 1975-1990 civil war. Hezbollah, currently the single most powerful militia in Lebanon and the Free Patriotic Movement (FPM) as well as Amal have joined forces in demanding the immediate resignation of the current Saniora government as well as early elections, claiming that the current distribution of seats in both the Parliament and the Cabinet does not reflect the true will of the Lebanese people. They also accused the government of supporting the continuation of the 2006 Israel-Lebanon conflict. On November 19, 2006, in an attempt to diffuse some of the escalating fear of the country's relapsing into sectarian strife and fears of a possible coup d'état by Hezbollah, Nasrallah expressly forbade supporters of the opposition from engaging in any conflict or responding to any provocations. However, he refused to rule out the possibility of ultimately "taking the issue to the streets within a six hour notice", if the government does not meet the opposition's demands. On November 21, 2006, Pierre Amine Gemayel, Lebanon's Minister of Industry was assassinated in Jdeideh, a Christian neighbourhood on the outskirts of Beirut. He was known for being a young, outspoken member of the Lebanese government, opposed to the former occupation of Lebanon by Syria and its influence in the country. Analysts say Gemayel's death is likely to worsen tensions in the already divided country . For dependent and other territories, see Dependent territory and List of unrecognized countries. 1 Partly in Europe. 2 The Republic of China (Taiwan) not officially recognized by the United Nations; see Political status of Taiwan. 3 Partly or wholly reckoned in Oceania.